Neighbors near the soon-to-be developed Errol Heights Park got good news late in the summer. As one of her last acts as Parks Commissioner, Portland City Commissioner Amanda Fritz announced additional money available, from Service Development Charge funds, to take the park project from a $5.3 million upgrade to a $12.7 million to build-out of the park's complete Master Plan. This Brentwood-Darlington neighborhood park's original Master Plan was created back in 2005, recalled PP&R Project Manager George Lozovoy. "We've listened closely to members of the park's CAC -- comprised of neighbors and representatives of organizations, such as the Johnson Creek Watershed Council. "What people have told us about the concept designs and proposed programming for the park really does count," Lozovoy remarked. "For example, we heard that the two proposed soccer fields weren't appropriate for the plan, so we've made that adjustment." On September 9, officials closed off S.E. 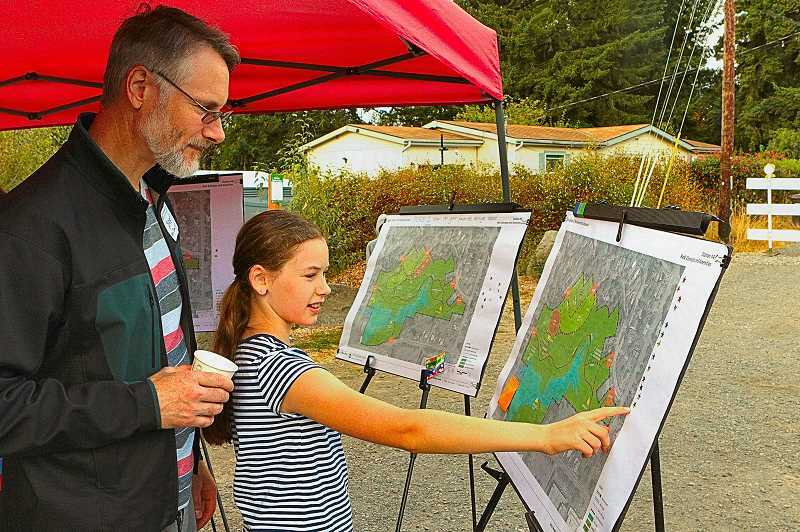 Tenino Street just west of 52nd Avenue to set up a "mini street fair"
where they held an outdoor open house, showing off the revised Master Plan. Although the sky threatened rain showers, many people turned out to see the progress for building out this Brentwood-Darlington neighborhood park. "We're pleased we've had so many neighbors come by, take a look at the plans, and comment on the progress," Lozovoy said to THE BEE at the open house. PP&R and CAC-guided trail walks helped those attending to learn more about the natural areas in the park. Many chose to look at the exhibits posted under canopies, and to indicate their favored options by posting stars on the posters. "It's been a really inclusive process; getting a variety of different views on the park's design," commented CAC member Brett Bolstad at the open house. Enthusiastic about how the CAC has helped shaped the project, Bolstad told how they worked with the Portland Bureau of Transportation to revise their plans to put a new road through the long-standing Errol Heights Community Garden. "And, we've made some of the major choices between preserving the natural areas, and providing areas for people to recreate; I believe we've struck a good balance to prioritize what our local residents will actually use in those recreational areas," Bolstad said. Lozovoy added they'll use the comments gathered at the open house to further refine the park's master plan.